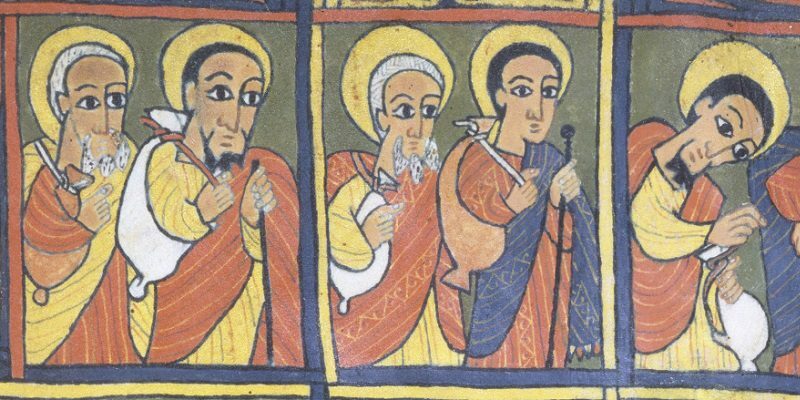 To be canonized as an official Roman Catholic Saint, you need to have produced at least two verified miracles. The New Orleans Saints got their first on Sunday, miraculously healing the crippled Eagles offense and blessing them with 39 points. It would have been 53 except for two inexcusably bad passes by QB Sam Bradford that were intercepted in the red zone, and that was a miracle too. Those were just the first and second interceptions New Orleans has had all year. New Orleans is pretty bad this year, though how bad has been overstated by a lot of Eagles observers. However, Drew Brees has been playing in the NFL since 2001 and is clearly losing steam. Losing Jimmy Graham has hurt their offense and the Saints had serious injuries including left tackle Terron Armstead and left guard Jahri Evans. Not surprisingly, this led to a huge game for Eagles RDE Fletcher Cox, who was named NFC Defensive Player of the Week after terrorizing Brees with three sacks, two forced fumbles and a recovery of one of those fumbles. The score was tied at 10 when New Orleans called a time out with 6:49 left in the third. Eighteen seconds later, the Eagles led 23-10 after a touchdown run, a strip-sack of Brees and a quick touchdown pass, even after replacement kicker Caleb Sturgis missed another extra point. The Aints didn’t put up much of a fight after that. For all their problems so far this year, no one can accuse the Eagles of giving up. Even Sturgis, who missed two kicks for the losing margin in Week 4 against Washington, rallied to make four field goals Sunday and lead the team in scoring (with 15). 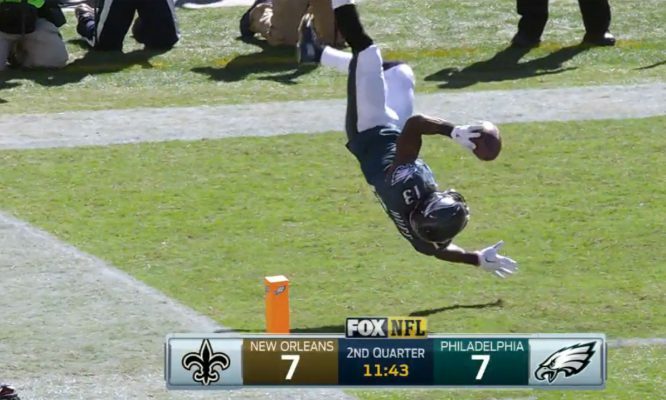 This was Josh Huff‘s breakout game. He ran the opening kickoff back 40 yards, rolled, got back up and kept running another 15-20 yards with youthful exuberance. Then, early in the second quarter, he took an 11-yard pass while two Saints CBs collided, and ran 30 yards in for a touchdown that tied the score at seven. Just before he crossed the finish line, with no defender near, Huff flipped himself into the end zone, bringing back the part of DeSean Jackson’s game that Philadelphia has missed the most: his inspired showboating. Was Chip mad? Yes. Not because of the flip, but just because Huff went in one-handed instead of securing the ball with two. Bradford was up and down, starting the game with two red zone interceptions that killed good long drives. 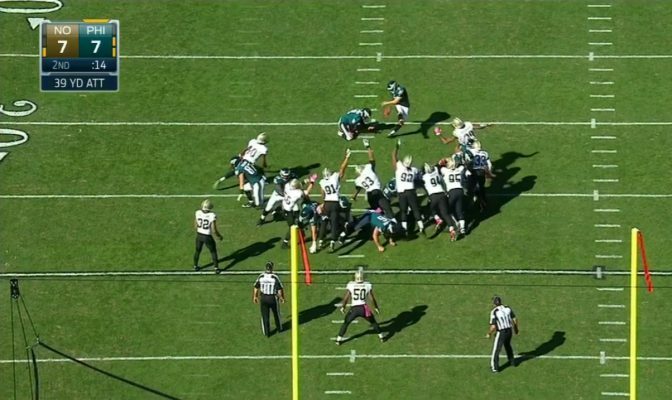 The first was especially bad — 6’4″ WR Riley Cooper was wide open at the front of the end zone, with no one behind him, but Bradford threw low and in front of him for an easy INT. The second RZ interception could have been an easy touchdown too, if better aimed. Not really, from what I saw on the tape. The pass to Cooper was smooth but slow and too flat, instead of the high arc over 6’4″ CB Brandon Browner that was needed. Browner still needed a great leap to nab it. The second RZ INT (on an attempt to Miles Austin) looked like an attempt at a low bullet, another bad decision because the DB was in front and low; a loft toward the back of the end zone would have been an easy catch. A long pass to Zach Ertz up the middle with 2:36 left in the second sailed over Ertz’ head and could easily have been picked off. One right before the end of the first half was over the head of Cooper and too short for Huff, who was in the end zone. It’s hard to know why; perhaps he was indecisive between the two targets and accidentally split the difference. Cooper had one bad drop on a short crosser and New Orleans played excellent defense on several incompletes. Bradford was 32-for-45 (333 yards) after all that, so he wasn’t terrible. But if he can clean his throws up just a little, and the offensive line continues the improvement that it showed Sunday, this team will at least be a lot more fun to watch.